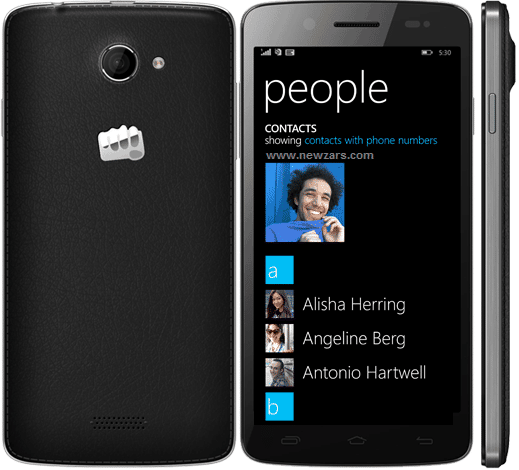 Two months ago Micromax launched two windows phone 8.1 devices ,Canvas Win W121 and Canvas Win W092. Now the Canvas Win W121 is available at online shopping sites such as Flipkart, Snapdeal, Amazon India etc at an effective price range of Rs. 9,484-9,999. It is a dual sim windows phone 8.1 device with a 8 MP primary camera and a 2 MP secondary camera at the front. It has a 5 inch 720p screen, 1 GB of ram, 1.2 GHz quad core Snapdragon 200 processor. As the general trend it has got 8 GB of onboard storage which expandable upto 32 GB via microSD card. In connectivity you get a Bluetooth 4.0, Wifi and micro USB 2.0. It runs on a 2000 mAh battery. Over all it is a very good smartphone at such a price. Micromax knows to attract Indians by keeping the price low and specs high. Going with the specs it will give tough competition to newly launch windows phones at this price range such as Xolo Win Q900s, Lumia 630 etc. Also read: Xolo Win Q900s a windows phone 8.1 device from Xolo , Lumia 630 specs. Previous articleAndroid one may launch on September 15th in India by Google ?